Roughly spanning the seventeenth century, the Dutch Golden Age was a time of artistic flowering. The Netherlands was among the great political, economic, and cultural powers in Europe, giving rise to some of the most celebrated artists of all time, chief among them Rembrandt van Rijn. While the Getty has a strong collection of paintings and drawings by Rembrandt and his contemporaries, we wanted to strengthen our holdings of early Dutch Golden Age drawings. On July 10, the Museum acquired at auction three spectacular drawings by masters of the Golden Age: Willem Buytewech (1591–1624), Herman Saftleven (1609–1685), and Esaias van de Velde (1587–1630). All three were celebrated artists during their time. Willem Buytewech was one of the greatest draftsmen of early seventeenth-century Holland. Known during his life as “Geestige Willem” (Creative William), Buytewech drew a remarkable range of subjects that revealed his fascination with all aspects of Dutch culture, from ordinary people at work to refined customs of upper-class burghers. Buytewech’s work is exceptionally rare (he only lived to age 33), and this is the first of his work to become part of the Museum’s collection. 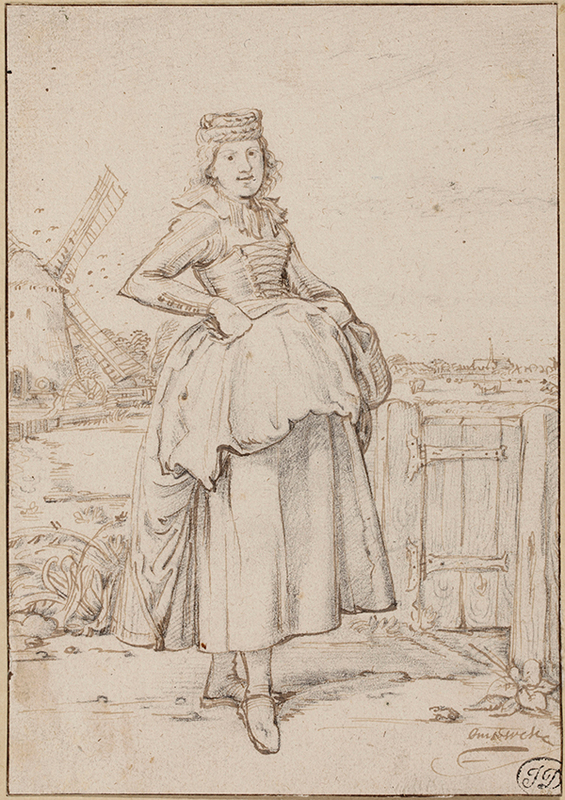 A Peasant Girl from Alkmaar (1621) features a smiling maiden with arms akimbo and a direct gaze standing aside a rustic wooden gate, with an iconic Dutch windmill at her left. Behind her, cows graze in a field, while a church spire punctuates the flat horizon. It is one of eight drawings by Buytewech showing young women wearing regional costumes of North Holland. It represents the Northern Netherlands’ attempt to assert its own national identity as it struggled to establish independence from Spain. This delightful watercolor by Herman Saftleven was commissioned by Amsterdam botanist and gardener Agnes Block. It was made as an independent work of art to be incorporated into one of the most famous florilegia (books of flowers) of all time. Block invited the greatest Dutch floral artists of the 17th century to come to her country house outside Amsterdam and portray her incomparable collection of floral specimens grown in her garden. 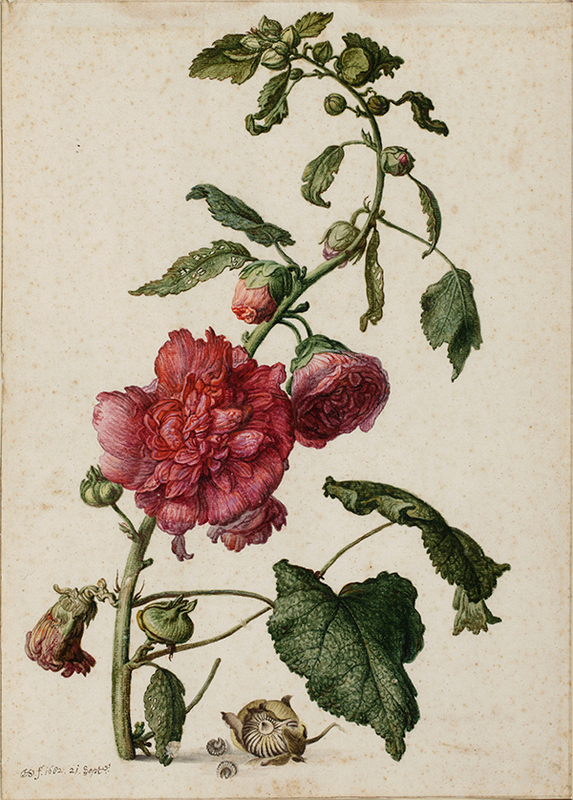 Saftleven’s contribution from 1682 depicts a spire of hollyhock (Althea rosea) containing a fully opened blossom, as well as buds and blossoms in various stages of emergence and decline. 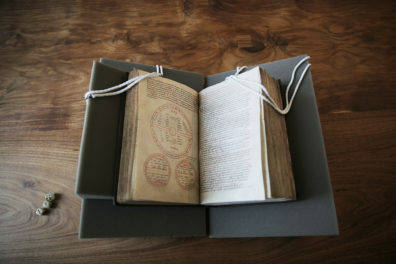 The spire “grows” magically from the blank sheet of paper, casting a shadow to the right. Every leaf and petal seems to tingle with life. This sense of vivid animation is heightened by the deep reds and greens of the blossoms and foliage. 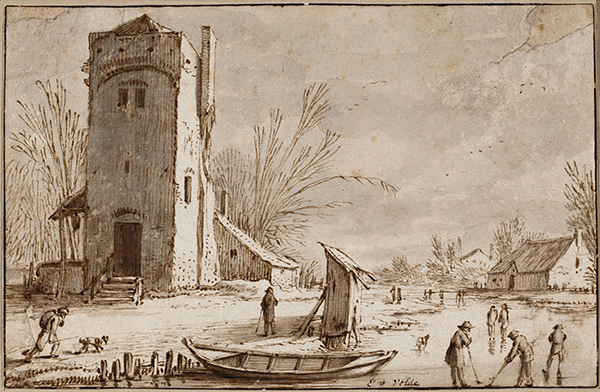 The final drawing of the trio is Large Square Tower to the left of a Frozen River, made around 1613 or 1614 by Esaias van de Velde. 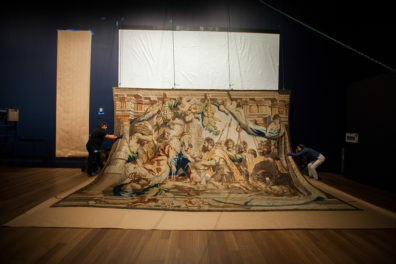 It is the first drawing by the artist to become part of the Museum’s collection. Van de Velde is best known for his scenes of the countryside and towns around Haarlem; he was also an influential teacher, counting among his pupils fellow Golden Age masters Pieter Molijn and Jan van Goyen. Here Van de Velde depicts a chilled winter day in a flat Dutch landscape. At left, a rustic tower with an adjoining well rises above a spray of leafless trees. 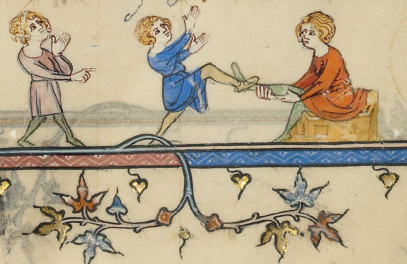 At right, a frozen river stretches into the distance while men play Kolf (a kind of ice croquet) and skate on ice. The gray washes in the sky heighten the sense of frigid winter weather. The work is one of Esaias’s earliest surviving drawings and presents the characteristics of flat, rustic Dutch landscape that came to define the genre. We are delighted to add these three acquisitions to our growing selection of Dutch drawings at the Getty, and look forward to sharing them with you in future drawings exhibitions at the Getty Center. I'm the senior drawings curator at the Getty Museum. Would love to have that hollyhock in my garden today. It is double but not frilly double of modern flowers.